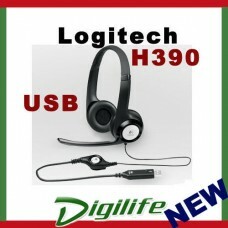 NEW MODEL, Replace logitech clearchat comfort headset. You wonât have to compete with background noise to be heard. The microphone rotates out of the way when youâre listening to music or watching a movie. Youâll experience clear, digital sound with the simplicity of a single USB plug-and-play connection.Whatâs good about USB for headsets? Please email us if the item is DOA (dead on arrival) within 7 days from the date of dispatch.We will replace the item if the returned item has been found faulty after the checking by our technician. However,you will be charged test fee $30.00 if the returned item is found to be working and the item will be delivered back to you at your expense.